BCDB Rating: 4.4/5 Stars from 31 users. This page has been viewed 194 times this month, and 9668 times total. Cartoon Characters: Puss in Boots, Kitty Softpaws, Humpty Dumpty, Rancher. Voice Actors: Antonio Banderas, Salma Hayek, Zach Galifianakis, Zeus Mendoza, Walt Dohrn, Billy Bob Thornton, Amy Sedaris. Produced By Joe M. Aguilar, Latifa Ouaou, Tom Jacomb, Andrew Adamson, Guillermo del Toro. Written By Brian Lynch, David H. Steinberg, Jon Zack, Tom Wheeler. Music: Henry Jackman, Sunny Park. Editor: Eric Dapkewicz, Rich Dietl, Stephen L. Meek, Alexander Wu. Originally Released on October 28, 2011. 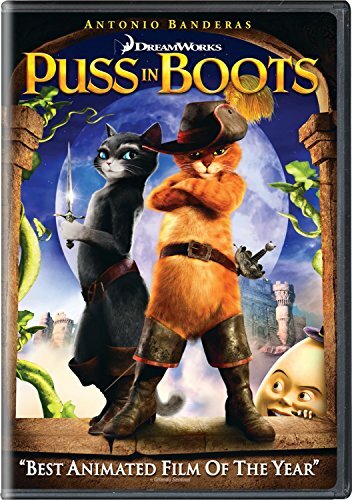 "Puss In Boots: The Story of An Ogre Killer." DreamWorks Animation and Paramount pushed up the release date of this movie by one week -- from November 4 to October 28, 2011 -- to allow it more room before a flood of family films opened over Thanksgiving in the United States. Production budget estimated at $130 million. You can watch this cartoon today on your computer. 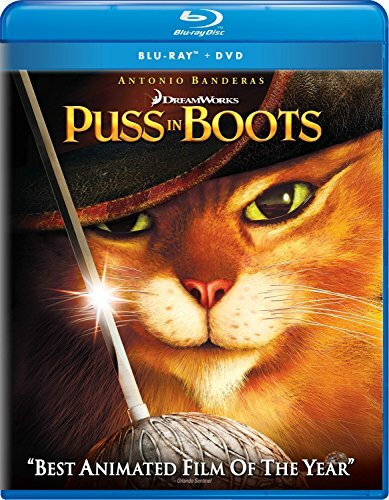 Just click below to start viewing "Puss in Boots" online now. Do you have anything to add to this page? Have we made any mistakes... or do you have any additional information about Puss in Boots? If so, we would love to hear from you. Please send us a quick note with your additions or corrections to this page, and we will make the corrections as soon as possible! Do you love Puss in Boots, or do you think it is the worst cartoon ever? Let us know what you think! Surely you have an opinion... so share what you think. Take a minute and post your own comments about this cartoon here. Puss in Boots by Big Cartoon DataBase is licensed under a Creative Commons Attribution-NonCommercial-ShareAlike 4.0 International License.